Kenyetta Alord, one of the fishers who worked on the video, told IPS that the video was important to "demonstrate to people that you definitely need help." He and several other fishers produced the video as part of a workshop sponsored by the UK's Darwin Plus project for climate change adaptation in fisheries. Darwin Plus helps Britain's overseas territories, including those in the Eastern Caribbean such as Anguilla, by funding projects in the areas of conservation and environmental sustainability. The workshop, which ran in late December, was conducted by the Trinidad-based Caribbean Natural Resources Institute (CANARI) and Anguilla's Department of Fisheries and Marine Resources. 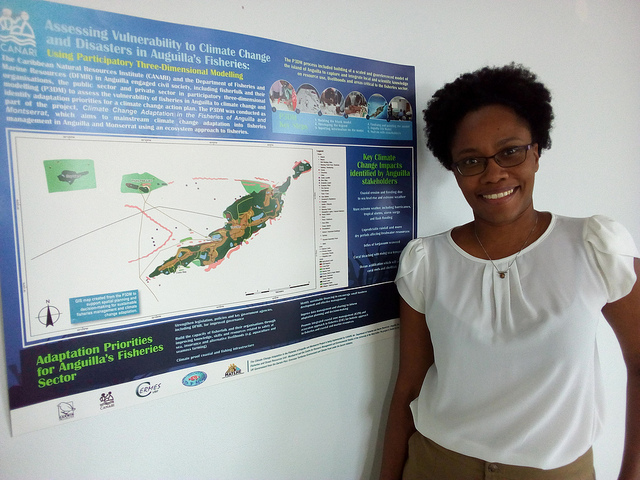 "It was part of a campaign of mobilising the knowledge fishers have to get them and the agencies that support them to start taking action on climate change," said Dr. Ainka Granderson, senior technical officer and manager of CANARI's Climate Change and Risk Reduction Programme. "The idea is that there is a lot of local knowledge about the impacts that have not been tapped into by the authorities," she said. "So the workshop was to get thinking about how they can share their knowledge and raise awareness about these specific aspects." Granderson said fishers often may not have "a clear voice" when it comes to decision making with regard to the fishing industry. The workshop on communications using participatory videos was designed to help them "say what are their priority needs and what are the actions they would like to see to build their resilience." The fishing industry is important for Anguilla's economy, said Director of Anguilla's Department of Fisheries and Marine Resources Kafi Gumbs. She told IPS via e-mail that the fishing industry is "the second highest revenue generator" for Anguilla. "Besides revenue, it forms an important part of the locals' diet and culture." She said authorities in Anguilla were concerned that the impacts of climate change could lead to the collapse of the fishing industry and related ecosystem services. In addition, her department was concerned about possible migration "and/or no or delayed migration" of some pelagics; sea level rise; loss of calcium carbonate plants and animals such as conch and lobster, the latter being Anguilla's main fisheries export; as well as damage to reefs and water inundation, since "a lot of the hospitality businesses which the local fishers depend on are along the coast." The fishers also feel the impacts of climate change in the form of rougher seas, said Granderson, that seriously reduce the number of days they are able to fish. "Snow storms in the U.S. produce groundswells, making very rough sea conditions. Every two weeks there are days when they cannot go out. It is an ongoing issue." Alord confirmed that rough seas pose a major challenge for local fishers. "Now you have to wait at least a month or two before you go out. Before, there were calm days in every month," he said. But "now we have to wait two months to go out, so we are earning a lot less." And because of the increasing fishing effort required, due in part to the effects of climate change, fishers also have to go further out to sea, greatly increasing their fuel costs. "Fuel is incredibly expensive on these small islands, which rely on fossil fuel. They spend a lot of money," Granderson told IPS. Alord said, "We had to show why we need these things in place. We have to present the videos in the most way where we definitely have to make them understand what we are saying." Granderson said the workshop training was successful partly because most of the fishers in Anguilla are young. "Because of that they were very accustomed to using Youtube.There was already a fisher who has his own Youtube channel that everybody follows, so they were tech savvy and used to using video," Granderson said. She said she was pleased with the response of the Anguillan fishers and their turnout for the workshop, which was unusually high. "There are a lot requests for their time, so there is a lot of stakeholder fatigue." She added that the quality of the video produced was also superior to that of other participatory videos CANARI had done over the years. "We will do an official launch next week….The feedback was generally very positive," Granderson said.